5-2828Platinum Color: Platinum Features: -Stainless Steel Dish, Wooden Perch, Toy Hook.-Non-Toxic and Bird Safe. Includes: -Includes 2 Stainless Steel Dishes, Toy Hook, Stainless Steel Seed Tray,4 Screw-in Casters, and 1 Wood Perch. Dimensions: -Dimensions: 28 Diameter. 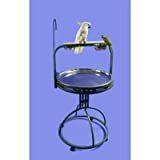 This entry was posted in Birds and tagged Bird, Color, Deluxe, Perch, Platinum, Play, Stand, Wood by One Boutique. Bookmark the permalink.